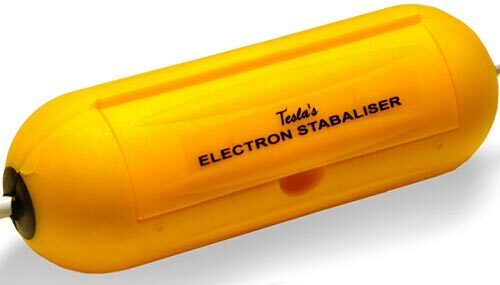 The Electron Stabiliser came about when Nikola Tesla became aware that the alternating current he had created would be far too strong for the human energy field to withstand. He issued the scientific community with a warning: "The Alternating current I have invented will prove to be the most dangerous thing on earth and I must find an alternative." The Electron Stabiliser is designed to change the flow of electrons from chaotic to coherent. This may result in the electrical frequency to become more harmonious with the human body, in addition to making electrical motors quieter and more efficient (fridges etc). One Electron Stabilser is needed per phase. Most houses run on 1 Phase Power. Works best when placed on an electical item on 24 hours with a steady flow, ie alarm clock. Commercial Premises often use 3 Phase Power and would require 1 Stabliser per Phase. The Electron Stabiliser came about when Nikola Tesla became aware that the alternating current he had created would be far too strong for the human energy field to withstand. He issued the scientific community with a warning: "The Alternating current I have invented will prove to be the most dangerous thing on earth and I must find an alternative." The Electron Stabiliser may the flow of electrons to go from chaotic to coherent. This may result in the electrical frequency to be more harmonious with the human body also quieter and more efficient electrical motors (fridges etc). One Electron Stabilser is needed per phase. Most houses run on 1 Phase Power. Works best when placed on an electical item on 24 hours with a steady flow, ie alarm clock.